Mark Fendley is the Web Development Manager at the University of Kent, leading a team responsible for the development and user experience of key web applications and services for students and staff. 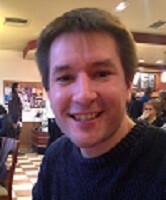 He has worked with the web for the last 12 years, initially by running a small IT consultancy before moving to HE. Mark is an advocate of agile techniques, being a key part of the implementation and evolution of Scrum in the Web Development team over the last few years before moving to his current role. He is particularly interested in the people/process mix to explore how best to enable a team to consistently deliver high quality products, whilst also having to support and maintain them. Mark gave a plenary talk on “From Hack Day to Open Day: Building a Tour” from 11.00-11.30 on Tuesday 28 July 2015.